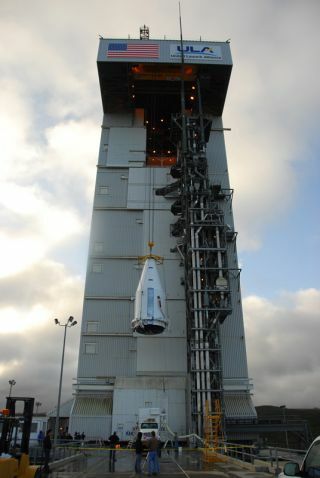 The new NROL-34 spy satellite and rocket nose cone are mated to its Atlas 5 booster in preparation for launch from Space Launch Complex-3 at Vandenberg Air Force Base in California on April 14, 2011. For its 25th launch Thursday night, the Atlas 5 rocket takes an unconventional shape that's not too strong and not too weak, but provides just the right amount of power for its payload. Liftoff is scheduled for 9:24 p.m. Pacific Time from Space Launch Complex 3 at Vandenberg Air Force Base in California. (That equates to 12:24 a.m. EDT and 0424 GMT Friday). The weather outlook is rather iffy due to gusty winds expected throughout the countdown and launch opportunity, leading meteorologists to give only a 30 percent chance of conditions being acceptable for liftoff. But preparations are proceeding as planned for the mission known as NROL-34, a classified launch for the National Reconnaissance Office. Final readiness reviews held Wednesday concurred that all systems were "go" for flight. A close look at the mission emblem for the secretive NROL-34 spy satellite mission as the payload is mated to its Atlas 5 booster in preparation for launch from Space Launch Complex-3 at Vandenberg Air Force Base in California on April 14, 2011. The configuration is unique because rockets typically fly with either no strap-on boosters or multiple motors. But the Atlas 5 was designed from its inception with the philosophy of each launch being tailored to the payload. If a cargo's weight needs the power of only one booster, then that's how the rocket will be built. For this particular payload, launching with no solids wouldn't get the job done and two boosters would be too much. One solid rocket booster is just right. As countdown clocks reach the final moments before launch, the kerosene-fueled RD-180 main engine on the first stage will rumble to life and undergo a computer-controlled check of its vital signs. If parameters are good, the command is issued to light the solid motor for liftoff. After clearing the pad, the rocket will head southward on 1.2 million pounds of thrust. It should be a spectacular nighttime ascent seen throughout the region. The United Launch Alliance Atlas 5-411 rocket has flown successfully twice before, lofting a commercial European TV satellite from Cape Canaveral in 2006 and an NRO spy satellite from Vandenberg in 2008. It's all part of the "dial-a-rocket" approach that designers took when creating the Atlas 5 family of vehicles more than a decade ago. Putting another solid motor on Thursday's launch would add unnecessary cost and complexity to the mission. "We're conditioned from 30 years of space shuttle launches to look for two, so this looks asymmetrical on takeoff. The fact is we didn't need two solids," said Lt. Col. Jenns Robertson, the Air Force launch director. "We've given plenty of tours out there and it tends to confound our guests. They keep walking around the rocket looking for the other one." The lone solid rocket booster consumes all of its propellant in about 90 seconds, providing the Atlas 5 an added kick during the initial climb away from the planet. The spent casing then jettisons and leaves the first stage's main engine to continue burning until about four minutes into flight before it separates from the Centaur upper stage. Exactly where in space the rocket is headed is kept hush-hush because of the payload's secretive nature. The NRO is the government agency responsible for buying, deploying and operating the nation's fleet of spy satellites. The mission poster for the National Reconnaissance Office's NROL-34 spy satellite launch. "Is this launch important? I'd definitely say yes. Every launch is important because of the cost it takes to get something into orbit. There is no money for unimportant launches," Robertson said. This will be the NRO's sixth launch since last September, a surge that involved Atlas, Delta and Minotaur rockets to carry critical satellite missions from Vandenberg and the Cape. Robertson's 4th Space Launch Squadron has overseen three of the missions, including the maiden West Coast flight by a Delta 4-Heavy in January. "I don't think there's a better job in the Air Force than launching rockets," Robertson said. "We get to actually throw things off the surface of the Earth. We get to fight gravity every inch of the way and fight against the laws of nature to get things into orbit. To do that successfully time and again is an incredible accomplishment, and to know those spacecraft are flying overhead day-and-night is a pretty impressive thing." You can follow the countdown and liftoff with complete live updates throughout the evening at Spaceflight Now's Mission Status Center.